Walls are as old as civilization itself. In this epic account, David Frye tells the story of history’s greatest manmade barriers, from ancient times to the present. The stars of the narrative are the walls themselves, rising up in places as diverse as Mesopotamia, China, Rome, Afghanistan, the lower Mississippi, and Central America. As we journey across time and place, we discover a hidden, thousand-mile-long wall in Asia’s steppes; witness the siege of Constantinople; marvel at the folly of the Maginot Line; shiver at the menace of the Berlin Wall; gape at Hollywood’s gated royalty; and contemplate the wall mania of our own era. 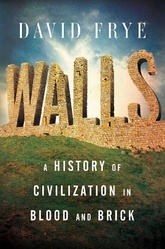 Evocative, amusing, and insightful, Walls reveals a startling link between what we build and how we live.